The Tokyo Mizube Line is water-bus transportation service, which navigates around the Sumida and the Arakawa rivers, Odaiba area and Kasai Rinkai Park. Other than general transportation service, they have many kinds of special cruising to enjoy Japanese events such as cherry blossom viewing in Spring and fireworks in Summer. The Water Bus “Himiko” Produced by Leiji Matsumoto,one of the best renowned Japanese cartoonists. “Himiko” is a completely unique water bus with its streamline shaped body with large windows. Himiko is named after Queen Himiko who was the first recognized independent lady in Japanese history. Himiko runs from Asakusa to Odaiba Seaside Park, to Toyosu and then back to Asakusa. During the daytime the futuristic ship runs through old Edo and modern Tokyo while enjoying 360-degree panoramic view. 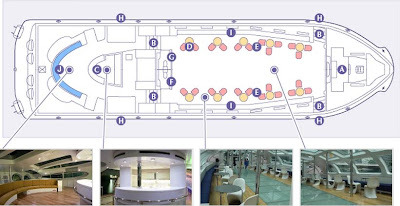 At night the floor panels are lit up and emphasize the ship’s sophisticated design. Himiko has a promenade deck to enjoy the scenery outside the ship. At night the Hotaluna Cruise lights up the back of the window glass on the rear ship emitting a pale light emitted during evening and night, so that it lights up like a firefly. The name Hotaluna is a combination of Hotaru the Japanese word for 'firefly', and Luna the latin goddess of the moon. Reiji Matsumoto designed and named Hotaluna to represent a firefly shining mysteriously at night under the moon while travelling across the Sumida River".